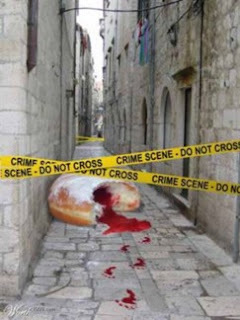 I'm sure many people have long wondered where to get the best tasting soofganiyot (jelly donuts) in Jerusalem. Finally, one man has taken up this challenge. That man is Avery Robinson (pictured at left with my son at a Detroit Pistons game in 2005). Avery, a Detroit native and Frankel JAMD graduate, is in Israel for nine months as a participant on Young Judaea's Year Course. He has taste-tested the various offerings in Israel's capital city and, through his blog, takes us on a virtual "journey through the various bakeries of Jerusalem." The Hebrew word sufganiyah derives from the Hebrew word for sponge (sfog) as its texture is similar to a sponge. In the month of Hanukkah (Kislev) Sufganiyot are sold all over Israel so Jews can observe the custom of eating fried foods in commemoration of the Hanukkah miracle of having enough Temple oil for eight nights. Potato Latkes are a delicious treat during Hanukkah, but having a religious/cultural excuse to consume jelly donuts cannot be beat (is there a blessing for cholesterol?). One of these years the Krispy Kreme franchise will wise up and become the world-wide corporate sponsor of Hanukkah. Good luck to donut maven Avery and I look forward to hearing who's selling the best hamantashen in Jerusalem this Purim!